Direct Deposit allows you to have all or part of your paycheck, benefits payments, or tax refund electronically loaded to your Prepaid Visa RushCard. There is no fee to enroll in Direct Deposit, and with it you could receive your payroll or government benefits up to two days sooner2. Can I set up Direct Deposit with a Deposit ID Number if I am not comfortable providing my RushCard number? A Deposit ID number is a secure alternative number that you can use instead of your 16-digit RushCard number to set up Direct Deposit on your card. 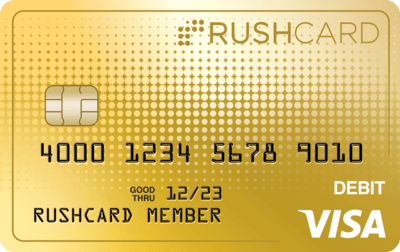 Call 866-RUSHCARD (866-787-4227), email agent@rushcard.com or, if you are enrolled in Rush Text Alerts, text "DD" to 697874 (MYRUSH) to receive your Deposit ID number3. Is there a limit to how much money I can Direct Deposit? Yes. See the Cardholder Agreement for full details on loading limits.